Hi People! Sorry This one took me forever, but if you’re a fan of our Facebook Page then you know it has something to do with my hand numbing up an alarming number of times. But anyway off to it. So I have watched the new Star Trek movie… a bit, and I absolutely LOVE it. 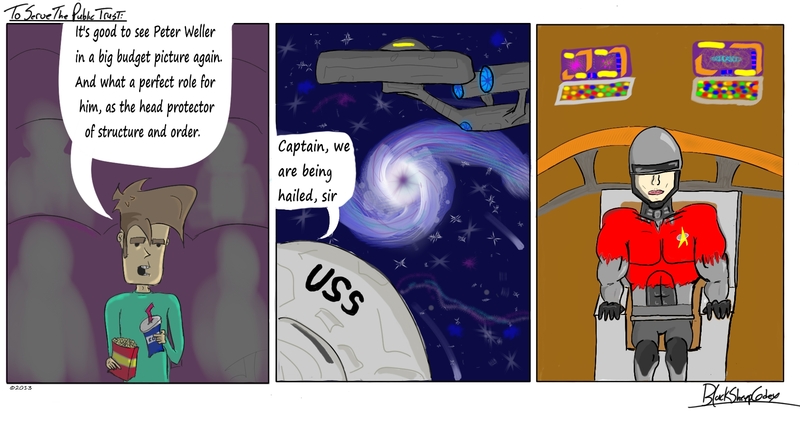 I’m sure I am going to get heat for this but I think it may be the best Star Trek ever!! If you haven’t seen it, you must immediately….unless you didn’t see the previous one, then see that first. So anyway I’m going to do this Spoiler free, so don’t worry if you haven’t watched this amazing movie yet, but I will tell you this comic probably would have been funnier had you already seen the movie….mayhaps I should have thought of that before drawing. So While I was watching the film, one of the characters was introduced and it made the child inside me yea merrily(pronounced “yay” for anyone not into linguistics). See The head-spaceman-in-charge of the federation fleet turns out to be portrayed by Peter Wellers. 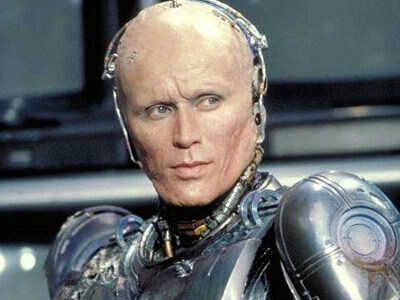 If you don’t know who that is by name, that’s okay….I forgive you, but you may better recognize him as F#@&in Robocop! If You don’t remember Robocop then promptly proceed to the nearest and highest ledge, then jump. He played a really good role and I thought it fit him well, but all that was overshadowed by the first reaction I had to him on screen…which was “Oh my God it’s Robocop!, Robocop’s the king of Star Trek land!”…granted I faded from intelligibility at the end there, but that was only because of an overload to the awesome sector of my brain. A few days after seeing the movie I realized that whenever I was recalling an event with P. Wellers in it…I was just planting Robocop in his place. So this is how I saw the film, and now you have too. Also you now have shared a little something with me….and it wasn’t sexually transmitted this time! 09 Jun	This entry was written by CatastroFUCK and published on June 9, 2013 at 2:32 PM. It’s filed under Movies and tagged J. J. Abrams, mental replacement, Peter Weller, Robocop, Star Trek, std. Bookmark the permalink. Follow any comments here with the RSS feed for this post.